No. 7-G, Jalan Kasturi 1, Kasturi Business Plaza, Balakong, 43200 Kajang, Selangor, Malaysia. Everstrong Machinery Sdn. Bhd. is a company involved in the marketing & distribution of all kinds of professional power tools for Malaysia. We are specialist in power tools, air tools and pump. Some of the brand names distributed by our company include Wind Speed, Makita, Dong Cheng Tools, Bosch, Hero Tech and etc. We also carry a comprehensive range of power tools such as Grinders, Drills, Orbital Sanders, Demolition Hammers and many more to cater to all your residential and commercial project needs. Whether it is a home DIY project or for use in a professional environment, Everstrong Machinery Sdn. Bhd. will troubleshooting your problem according to your budget. 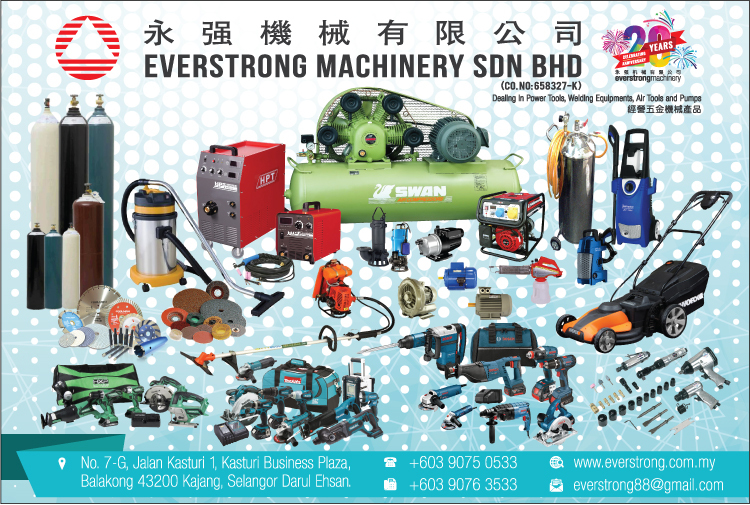 Everstrong Machinery Sdn. Bhd. is trying to constantly innovate in techniques and improve its products, supply its clients the best possible products and services.